Dance Dialogue | Opinion. Debate. Review. It seems a pity that female choreographers have such a small voice in the professional dance scene that a body such as the Female Choreographers’ Collective should even exist. Correct me if I am wrong, but in most other contemporary artforms, women have reached parity with, if not exceeded, the artistic accolades of their male colleagues. Why then should dance be left in the shadows? In their upcoming event, “The Experiment”, the Collective will show 6 pieces of work: 3 male- and 3 female-choreographed, in a bid to see if there is any correlation between how a dance work is percieved and the gender of the creator. A curious idea, with the purpose of attempting to assess if there is a gender divide in dance. I find it hard to see how any conclusion will be drawn without painting with some very broad brush-strokes. Several things come to mind when I think about the much asked question, why are there more top-flight male choreographers, particularly in the UK. On a quasi-Freudian level, most men that make it to the top in dance have endured some stigma about being the only boy in their ballet class, and develop a thick-skin and a strong jaw in the process. On a completely different scale, with fewer boys in training than girls, in an ironic effort at bringing about a level playing field, a higher proportion of boys will be indulged in their choreographic efforts. Gender-associated character traits must too play a part. Is it a case that the predominance of male choreographers in the dance world is inversely proportional to the relative numbers in training, in which case, as dance becomes a more acceptable and viable career path for men, thus the disparity will level out? The conundrum is multi-faceted, each argument supported by research and rhetoric. 2012 was truly a year of plenty. The Olympic and Paralympic Games, and to a somewhat lesser extent the Queen’s Jubilee seemed to rouse everyone into action and were undoubtedly the inspiration for most cultural events on the calendar. This was certainly true in the dance world, with Dance GB and Titian:Metamorphosis at the Royal Opera House being the most celebrated collaborative dance events of the year. While they garnered a lot of publicity, and were commercially successful, they were artistically forgettable for the most part. Arguably the most important events in 2012, for dance-folk at any rate, happened off-stage. We bade farewell to Dame Monica Mason, Wayne Eagling and Ashley Page as Kevin O’Hare (Royal Ballet), Tamara Rojo (Engligh National Ballet) and Christopher Hampson (Scottish Ballet) acceded three of the most prominent artistic directorships in the country. Although yet to affect any real changes, something tells me that a sea-change is afoot, with Rojo having the most to prove, given her status as an international star. Regarding what happened on stage during the year, two highlights stick out in the memory. Marking the 20th anniversary of his death, Kenneth MacMillan’s triple bill at the ROH in the autumn was outstanding and a huge tribute to his genius (http://wp.me/p20ZbZ-37). Up at Sadler’s Wells Helgi Tomasson’s San Francisco Ballet made a welcome return with a huge programme of various short ballets proving a wonderful showcase for the company, right across the ranks – they provided us with a surge of inspiration as we headed into the long winter with endless Nutcrackers. As the rest of world goes into a post-2012 slump, given the changes at the top in the dance community, there should be enough to keep us excited – different repertoire, fresh faces and new creations. Among the highlights are sure to be Alexei Ratmansky’s Romeo and Juliet (National Ballet of Canada, Sadler’s Wells), Northern Ballet’s The Great Gatsby, Wayne McGregor’s Raven Girl (Royal Ballet) and to stop any local complacency setting in, Boston Ballet’s trip to the Coliseum in the Summer, overflowing with neoclassical treats from Balanchine and Forsythe. As always, the year will throw up surprises and disappointments, forgotten treasures and new stars – please 2013, give us your best! I have long been an ardent and vocal devotee of Mr. Balanchine; his ballets excite me like those of no other. However, the recent Royal Ballet triple bill of Sir Kenneth MacMillan’s work is a fitting homage on the 20th anniversary of his tragic death, but more importantly, a reminder of the real extent of his genius. More closely associated with his full length ballets – Romeo and Juliet, Manon, Mayerling – than his shorter works, it is in these less renowned one-acters that his artistic range is really evident. The strictly academic, but utterly joyous Concerto; the dark and unsettling Las Hermanas; the elegiac and uplifting Requiem. Three completely different ballets, not only in content, but in style, mood and intent. The one unifying factor is MacMillan’s thorough knowledge and reverence for the classical technique, and moreso, how it can be employed to achieve a huge range of emotional states. Concerto, with it’s wonderful military-flavoured Shostakovich score, is closely related to some of the works of Balanchine in its minimal aesthetic. Unlike Balanchine, MacMillan savours the conventions of the classical form, rather than reinventing them. The bouyant opening and closing sections sandwich what must rank as one of the most beautiful adagio movements in the neoclassical repertoire. Las Hermanas, a distillation of Lorca’s The House of Bernarda Alba, is more traditional MacMillan territory; can any other choreographer confidently portray sexual violence or despair through the medium of classical dance? Requiem is at the far end of MacMillan’s vast repertoire – his homage to colleague and friend John Cranko, set to Fauré’s work of the same name. While it is overtly religious, it still remains abstract – any narrative being personal to the viewer. It is one of those work sthat leaves one breathless, the interpretation of the music being so pitch-perfect. There have been many choreographers over the decades that can match MacMillan in both popularity and work-rate, but this triple bill is just one incidence that confirms that none of his choreographer-contemporaries quite makes the mark when it comes to range. Balanchine cornered the market for abstract ballets to be sure, Tudor was the master for ballets which delve into the psyche and Ashton and Robbins were his equal for sumptuous, breathtaking beauty; but no one else can claim to be as adept at all three. And 20 years on still there is no one. All hail. Olivia Goldhill and Sarah Marsh of the Guardian recently posed the question “where are the black dancers?” in reference to classical ballet companies. I immediately thought “well there is Carlos Acosta….and Misty Copeland…..Junor Souza…….Eric Underwood”, and my list quickly fizzled out. The black dancers are out there, they just aren’t given the roles and are thus not visible. When Arthur Mitchell and Diana Adams created the iconic pas de deux in Balanchine’s Agon in 1957, the visual impact was heightened immensely by the fact that he was black and she was caucasian. 50 or so years on, the pairing of Eric Underwood and Sarah Lamb in Wayne McGregor’s Infra seemed to hold the same allure. Why? Because we’re just not used to seeing it. Some parties still argue that ballet developed in Europe in the latter half of the last millenium and everyone involved was white, and through the centuries we’ve become conditioned to expect a certain look, and when we’re confronted with something else we somehow, automatically, think it’s “wrong”. In the sporting world no one raises an eyebrow when the entire field in the mens 100m sprint is of Afro-Caribbean descent – that’s because these gentlemen are simply faster than runners from a different ethnic background. This cannot be said for dance, where your place in the corps de ballet might depend on the colour of your skin and not your talent. 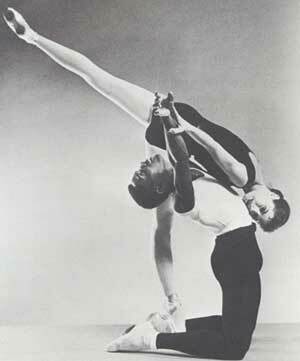 As I have mentioned above, some black dancers have made their mark in the classical ballet world, but the fact that companies have existed and continue to exist, like Ballet Black in London and Dance Theatre of Harlem, to employ dancers from ethnic minorities (in a dance-sense), speaks volumes. I’m not just trying to fly the flag for racial equality here – the present situation poses problems for future generations of both dancers and audiences. Ballet already suffers from the curse of being seen as elitist. Until dancers of all backgrounds are working at a visible level in high-profile companies, ballet will remain in its Ivory Tower. That the “look” of a work might suffer because of the lack of ethnic uniformity in the corps de ballet is rubbish – and the longer ballet companies maintain this stance, the less relevant they will become. An artform can only be relevant if it is reflecting the times in which it exists – so the sooner we see more different shades of skin on stage, the sooner ballet can start it’s uphill struggle towards being a contemporary artform again. Of all the new works of dance being produced around the world, surely the percentage of those falling into the category of ballet (whatever that means to you) is ever decreasing. Here in London there are several platforms for presenting new contemporary dance, and a huge number of independent choreographers and small companies working in that hemisphere of the dance world, generating innumerable exciting works. In the classical domain, there are but two companies of note in the city – English National Ballet and the Royal Ballet, which present an embarrasingly small number of new works each year, especially given the latter’s government subsidy. Ballet has faced an uncertain future for a while now. At various points in the past it has looked extinction in the eye, but thanks to timely and innovative choreographers and directors, Balanchine and McMillan to name but two, it has lived to tell the tale. Once again it finds itself at a fork in the road, one branch veering towards the past, the other rolling towards and exciting, if uncertain, future. Ballet companies have always depended heavily on a roster of established classical ballets, those ones that represent almost guaranteed ticket sales, and that for some reason most are keen to disassociate themselves with as the 21st century ploughs ahead. Choreographers like Michael Corder and Christopher Wheeldon, prolific and talented though they are, create work that keeps the classicists happy, but only because it’s almost all been seen before – and while a certain demographic is politely pleased by these kind of works, it’s not going to be enough to get any new faces in the audience or send sparks flying in the arts pages. On the other hand, the works of Wayne McGregor et al represent a new approach and forward-thinking physicality that has gotten people talking – but for most of us, it has little enough link to the classical heritage that it doesn’t warrant the ballet seal of approval. Monica Mason showed a lot of gumption when giving McGregor the coveted role of Choreographer – in – residence at the Royal Opera House, and it’s easy to see that she was trying to inject some pace into the institution. I’m certainly not alone in thinking that he was not the right choice for the job, as a company with a long heritage such as the Royal Ballet needs a sense of continuity to tie it’s present to it’s established past. Once hives of bold creativity and invention, our extant ballet companies find themselves in a rough position. Spend their money on something safe and derivative, or splash the cash on something that will cause as many sneers as grins. Both approaches will have their detractors – that’s just what happens when you’re spending public money – but sadly it’s not just a question of numbers. The decisions choreographers and artistic directors make are driving forces not just in the survival of individual companies, but of the artform in its own creative ecosystem. No Such Thing As Bad Press, Right? Once again “ballet” took the limelight recently and was brought to the masses; this time to an audience of millions as part of the Olympic closing ceremony. As a Darcey Bussell fan, I had held high hopes for the success of her involvement and given the setting, it could have been spectacular. I stand disappointed. Ms. Bussell, five years on from her retirement from the Royal Ballet, showed she still has it. Sadly, the choreography (the only word that adequately describes this is “naff”), costumes and music were a puerile attempt to get viewers to swallow the bitter ballet-pill. I was once of the opinion that so long as dance was being represented in such a public arena, all was well – I have now revised my thinking. A very dear friend once said to me “it doesn’t matter that people are reading books, if the books they are reading are awful”; the same goes for ballet – it would have been better had it been absent from the closing ceremony, rather than being present in such a cheapened form. An artform, such as dance, can only survive if it maintains its standards. If its popularisation depends on lowering these standards, then the artform is doomed to failure. Ballet is not what we saw in the Olympic Stadium on Sunday evening, and trying to say it is only serves to under-cut what dancers and choreographers have strived for centuries to promote and preserve. And it wasn’t only the production that I must find fault in, but some of the dancers – many of whom seemed very unfamiliar with the pointe shoe. I’m all for giving something a go, but when an audience of millions is watching, there’s no place for ballet-dilletantes. I am fully aware that with the opening ceremony and athletics taking precedence, there wasn’t much time to rehearse in the performance space. Such details being known very much in advance should have served as an opportunity for the production team to pare down their ambitions. Classical Ballet, and Darcey Bussell, both have suffienct integrity to stand their ground in such a setting, without all the hoopla that we witnessed. It would have served both better to have been given something more in keeping with the art’s heritage, rather than dragging dance further into the gutter and away from it’s lofty past. Along with the tutu, the pointe shoe has long been part of cultural iconography and at the forefront of public perception of classical ballet. However, when ballet as we know it today was developed around the time of August Vestris, the pointe shoe was nowhere to be seen. Much like today, the audience in the early 19th century loved a trickster and when Italian grotteschi performer Amalia Brugnoli yanked herself up on to her tippy-toes, everyone wanted part of it. Marie Taglioni, far from being a virtuoso, set to work on her own version Brugnoli’s trick; what resulted was a technique of floating off the ground until she was connected to it only by the ends of her toes, and thus a legend was born. With little more than some darned satin seperating flesh from floor, dancing en pointe provided the perfect otherworldly aquality we now associate with creatures of 19th century ballets – sylphs, ondines, willis, dryads and the like. As with every walk of life, as soon as a skill is perfected, someone comes along and takes it to another level. In this case, the floaty pointe work of the Romantic era gave way to the new virtuosi of the Russian Imperial ballet – when Taglioni flitted about as La Sylphide in 1832 she would scarcely have fathomed Pierina Legnani’s 32 fouettés en pointe 60 years later. As the decades went past and skills en pointe were second nature for the female ballet dancer, the discipline had to expand somehow. With ever shorted tutu-skirts, the focus was now well and truly on the feet and, as ballet is concerns with the aesthetic, the next question was “how do we make our feet nicer?” Pointe until the 20th century had been a case of function over form, out of necessity, but with advances in shoemaking, dancers were ever more concerned with how the curve of the instep finished off their classical line. As the 20th century went on, we can see that dancers went from being en pointe in the true sense, to being “over” pointe. Once a dancers weight is gone past the vertical, in search of a bulging instep, that connection with the floor and the upward lift from it, is gone. Once a shift in aesthetic has occured, it is hard to ever go back. A young dancer idolising Svetlana Zakharova might turn their nose up at Carlotta Brianza, the first Aurora. Feet have become hard currency in this business, and more often than not they are the first assessed and assessable attribute of a dancer. In the space of two centuries the art of pointe work has moved on significantly, while ballet steps themselves have remained. Where the pointe shoe will go from here is hard to tell, but it will keep evolving; however, in order to keep it from straying too far, it would be worth, every now and again, thinking of how Taglioni managed to do it without toe-pads! Just over a year ago, I found myself in the familiar setting of a dance audition. As with many auditions, the first challenge to be negotiated was a classical ballet class. Having been through ballet school, I thought I knew what to expect from this, indoctrinated into thinking that the formula was always more or less the same. The teacher, Patrick Wood, stood at the barre in 3rd position and did, what was for me at that moment, an unusually simple but alien ports de bras exercise. I recognised all the elements, but I had never seen them assembled in such a way or with such a focus on the use of the torso; and 3rd position, one of the 5 basic positions of the legs in classical dance, had thus far been treated dismissively, to my eyes, as just for children, who can’t yet manage 5th. Far from being a frustrating and disorientating experience, that simple exercise instantly changed something in my mind and body: I finally started to understand the technique of classical ballet. This audition led me to three more people who have become instrumental in how I have approached dance since: choreographer Susie Crow, dancer and teacher Bethany Elliott and the man who in turn has influenced the other three, Roger Tully. Taking class and discussing with Patrick and Roger, and creating work and dancing with Susie and Bethany have lifted the veil to show me the true workings of this beautiful discipline, which I was in danger of falling out of love with. Initially I thought I was privy to some cutting-edge radicalism – the line of aplomb, en dehor and en dedans as positions of the body, oppositions, spirals, the real application of épaulement – but really they are just the principles of classical ballet. Not to insinuate that I had bad teaching, far from it in fact, but it was through these teachings that I began to understand that it is not about feet and legs, but that everything is instigated by the body – this may sound obvious, but as an aesthetic, physical artform, ballet has become consumed by its obsession with the lower limbs. The irony is that once you pare it back to the true principles, turn-out and extension are easier and the “dance” becomes inherent in every position: that’s the beauty of the pure classical form – even in stillness there is dancing. Ballet class has taken on a whole new dimension for me; it had become, lamentably, about fitness and maintenance, but now it is more about questioning and discovery. In Frederick Wiseman’s documentary, La Danse, a repetiteur comments that “Suzanne Farrell’s faults became other’s qualities” – like everything else, our artform is subject to trends, but rather than continuing blithely down these forks in the road, we could do ourselves a favour and bring it back to basics. Will Fortune Favour The Bold? English National Ballet gave the ballet world a jolt last week with the announcement that Royal Ballet principal dancer Tamara Rojo would take over as Artistic Director from Wayne Eagling when he steps down in the autumn of this year. However, at 37 and at the height of her dancing powers, she will be a director who still performs with the company. This has been done in the past successfully – Vladimir Malakhov, for example, is at the helm of Staats Oper Berlin and still performing; that?s not to say that it is always a winning formula. English National Ballet is a company that is fighting for survival as it is, with a dedicated and experienced director – how they will fare with a leader who needs time to do class, rehearse and sew her pointe shoes, remains to be seen. It is no surprise that Ms. Rojo ended up as a company director. A few years ago she shadowed Karen Kain, Director of National Ballet of Canada and she has been very vocal in the past about her leadership ambitions. Indeed she has admitted that she applied for Monica Mason’s job as director of The Royal Ballet, so not only is she ambitious, those ambitions are lofty ones. A director who is still dancing brings a lot to the table: they are in touch with the needs of dancers on a daily basis and have a full appreciation of training needs, the rigours of performing and the emotional investment it takes. So, for the dancers, having a director who is also a sympathetic colleague will be a boon. But a ballet company is far more than its dancers, and a director who is spreading herself thinly might not be the salvation a company like this need. From watching Ms. Rojo performing over the years, and from what I have gleaned from interviews she has given, she is an intelligent, ambitious and fearless woman with a deep understanding of her artform: all attributes that go towards making her an ideal candidate for artistic director of a ballet company. However, I cannot shake the feeling that it is too much, too soon. Delegation will be the name of the game here, as the artistic staff of English National Ballet will have to take more responsibility than before, to cover the shortfall that Ms. Rojo’s own dancing career must surely result in. I’m not saying that she’s being selfish in taking this job and still wanting to dance, but merely that her ambitions may be tripping her up; her dream of leading a company from the wings being realised before she’s ready to relinquish her role of leading it from the stage. Undoubtedly, Rojo’s international reputation as a dancer will open more doors for English National Ballet and hopefully it will attract new audiences and sponsors. It is a bold move on the part of the board and also Rojo herself, but we know what they say about those who are bold, so hopefully fortune will be on their side. Here is a case of a series of events happening at just the right time; we just don’t know if all the elements will work until it hits the ground. I sincerely hope it does, because it could be spectacular. Training to be a professional ballet dancer in Ireland is not easy. Unlike many other countries there is no nationally recognised ballet academy or any full-time ballet school for that matter. Although there are companies that engage professional dancers, though not on a year-round basis, to get to a level where employment is a viable option, training at a recognised vocational school abroad is the only option. So, with nowhere to get the requisite training and no companies able to provide some form of secure employment, you might be forgiven for thinking that ballet was a relatively novel pursuit in Ireland; curiously, that is not the case. Schools and companies have flourished in the past, organised and patronised by various well-connected members of the artistic community such as Ninette de Valois and W.B. Yeats, but the standing of ballet is more than likely worse now than it was 50 years ago. Your critic raises an issue of importance to all lovers of ballet in this country when he praises (November 11th) the really excellent programme of the National Ballet School and then asks: Quo Vadis? We have now got a school of ballet, a teacher of ballet, and a number of young ballet-dancers, demonstrably comparable…to the London Standard. What is going to happen to them? Are we merely to become a recruiting ground for the big cross-Channel companies like Festival? Or is there a chance of keeping our young dancers here and enjoying the rich reward of the balletomane, of watching a striking talent develop and deepen over the years? The problem is a real one. I cannot see either Dublin or Cork maintaining as yet a permanent company, even with the aid of the provinces. Provincial Ireland is not yet ballet conscious. It will take time. But Covent Garden ballet today really originated with the Camargo Society, and owes everything to it. I suggest something on similar lines – guaranteeing an audience at fairly frequent intervals for a series of programmes which would include distinguished guest artists might, with the co-operation of the Arts Council, and one of the Dublin theatres, furnish a solution. Or has anyone an alternative? With a few minor changes, this letter could have been written last week. It was, in fact, penned in 1958. Little has changed. The fact that there was a National Ballet School (founded in 1953 by Valentina Dutko and Cecil Ffrench – Salkeld and directed by Patricia Ryan until its demise in 1963) at the time, shows that we may even be less well-off now. Many dancers born here moved away to train and have found work abroad, in the absence of permanent work here: Sara Reynolds trained at Central School of Ballet and now works for Nederlands Dans Theater; Melissa Hamilton trained at Elmhurst and is a soloist with the Royal Ballet; Tracy Jones trained at the Royal Ballet School and dances for Ballet Barcelona. That is to name but a small few who are currently working abroad – in the decades since this letter was published, many more dancers left Irish shores to get their ballet education and stayed away, in the knowledge that living the life of a professional dancer at home was not a possibility. Last year the previously titled Ballet Ireland became National Ballet of Ireland, although it still only operates for less than 6 months a year. Cork City Ballet operates for an even shorter period. Both companies source most of their dancers from overseas. The lack of continuity and paucity of home-grown talent do nothing for the cause of generating audiences. On a more positive note, younger dancers are being fostered by organisations such as Irish National Youth Ballet, Youth Ballet West and Monica Loughman Ballet with many are getting to a level where they can enter full-time vocational training; Loughman is actually in the process of setting up vocational academy, but whether Irish parents will show any interest in paying €8000 a year in fees, when they see little evidence of employment opportunities at the other end. I agree with Mr Gibbon in his suggestion of “fairly frequent intervals for a series of programmes”, as it would go a long way in educating audiences on the breadth of ballet but the Arts Council cannot be blamed for their scant interest in promoting what they see as classical ballet in the face of cutting edge contemporary art and theatre, as is their remit. At the other end of the spectrum lies the ballet going public, who like to be comforted with productions they know: Nutcracker will get will be a box-office hit, regardless of quality in a lot of cases, while a triple-bill of abstract work will no doubt leave the still “not yet ballet conscious” provincial audiences saying “that’s not ballet, there were no tutus”. Caught in the middle are the ballet companies, wondering who’s best to please. Either way, the one-way traffic of indigenous talent will continue until dancers have some kind of job-security. Given the content of Mr Gibbon’s letter, some 54 years ago, and its resonance today, it’s very hard not to worry if the ballet ship has already sailed.